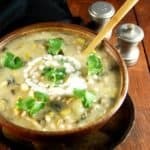 This White Bean Chili made in a pressure cooker is smoky with cumin, rosemary and jalapenos, and creamy with cashews and potatoes. 1 cup dry white beans like cannellini or great northern beans, soaked for a couple of hours, then pressure-cooked until tender. My pressure cooker takes 10 minutes to cook beans without soaking them first. Alternatively, use 2 cups canned, drained and rinsed beans. 1/4 cup cashews soaked and blended with 1/4 cup water into a thick, smooth paste. Heat the oil in a saucepan. Add the leeks and garlic, season with salt and pepper, and saute over medium heat until the leeks are limp, about five minutes. Add the cumin, cayenne, jalapeno, rosemary, and oregano. Saute for a couple of minutes. Add the corn kernels and let them heat through. Transfer the entire mixture to a pressure cooker, and add the beans. If you cooked your beans in the pressure cooker first, no need to rinse the pot. Just drain off all but 1 1/2 cups of water and add the other ingredients to the beans. If using canned beans, drain and rinse the beans and add 1 1/2 cups of water or vegetable stock to the pressure cooker. Give everything a good stir and put the lid of the pressure cooker on. I set the timer at 10 minutes for the chili to get cooked, with all the flavors merging well together and the potatoes soft enough to be crushable. Once the pressure-cooking is done, wait until all of the steam's gone or release it following your manufacturer's directions. Carefully open the lid. Give the chili a good stir and add salt to taste. I like smashing some of the potatoes against the wall of the pot with a ladle to thicken up the chili. Stir in the cashew cream. I really like this because it makes the chili so creamy, but leave it out if you absolutely don't want to add it.